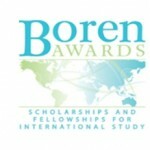 Boren Awards, funded by the National Security Education Program (NSEP), provide unique funding opportunities for US undergraduate and graduate students to study less commonly taught languages in world regions critical to US interests and underrepresented in study abroad, including Africa, Asia, Central and Eastern Europe, Eurasia, Latin America, and the Middle East. As NSEP initiatives, the Boren Awards focus on countries, languages, and fields critical to U.S. national security, recognizing a broad definition that includes traditional concerns of protecting American well-being, as well as challenges of global society, such as sustainable development, environmental issues, disease, migration, and economic competitiveness. The Boren Awards emphasize less commonly taught languages and long-term linguistic and cultural study, as well as research and academic internships abroad. Study of a foreign language appropriate to the country or region is an integral part of each Boren Scholar and Fellow's plan. Boren Scholars and Fellows represent a vital pool of highly motivated individuals who wish to work in the federal national security arena. In exchange for scholarship and fellowship funding, Boren Award recipients commit to working in the federal government for at least one year after graduation.